Mumtaz Mahal, which means "the chosen one of the palace," was born September 1, 1593 and died on June 17, 1631. Mahal was the chief consort of the emperor Shah Jahan. She was also a Mughal Empress herself. Mumtaz Mahal is very important to the Taj Mahal; the building was constructed specifically as a tomb and final resting place for her by her husband. Mumtaz Mahal, born Arjumand Banu Begum, was born in Agra. However she was not an every day citizen; Mahal was born into nobility. She was the daughter of Abdul Hasan Asaf Khan, making her the niece of Empress Nur Jehan, who was married to Emperor Jahangir. Religiously, Mumtaz was a Shia Muslim. Although Begum was betrothed to Shah Jahan (also know as Prince Khurram) at the age of fourteen, she ultimately became the love of his life. They did have to wait five years before they became married. The date of their marriage, in 1612, was selected by astrologers of the court to be most effective in ensuring a happy marriage. 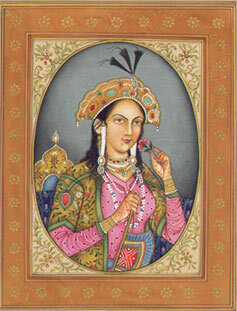 Khurram gave Begum her new name, Mumtaz Mahal, shortly after their marriage. Khurram acquired two other wives in the five years after meeting Mahal before their marriage, but he became so smitten to Mahal that he showed little interest in his two other wives, and in his polygamous right in general. Khurram reluctantly sired a child each with his other two wives, as it was his duty. His relationship with the two other wives can be described as "nothing more than marriage," while he put a thousand times more effort into his relationship with Mahal. Khurram's affection towards Mahal was very much reciprocated; she was deeply in love with her husband as well. Despite numerous pregnancies, Mahal travelled with Khurram all over the Mughal Empire, as well as throughout his military campaigns, which ultimately lead to rebellion against her father. In the nineteen years Mahal was married to Khurram, they had fourteen children, seven of which died at birth or during a very young age. Mahal died in Burhanpur giving birth to her fourteenth child. She had been accompanying her husband on a military campaign. She was buried temporarily in Burhanpur, but this was never meant to be her final resting place. It was reported that the emperor was inconsolable at the time of her death, and disappeared into hiding for a year. It was ultimately Jahanara Begum, their oldest daughter, who brought him out of hiding. He was a different person now. It was reported that his hair had turned white, his face was worn, and his back was bent. Jahanara went on to take her mother's place in the court. As Emperor, Jahan's full title was Shahanshah Al-Sultan al-‘Azam wal Khaqan al-Mukarram, Malik-ul-Sultanat, Ala Hazrat Abu’l-Muzaffar Shahab ud-din Muhammad Shah Jahan I, Sahib-i-Qiran-i-Sani, Padshah Ghazi Zillu’llah, Firdaus-Ashiyani, Shahanshah—E—Sultanant Ul Hindiya Wal Mughaliya. Mumtaz Mahal was married to another man before Shah Jahan, and he killed her husband so he could marry her. Shah Jahan married Mahal's sister after her death. Shah Jahan's sons fought against each other for the crown in the Battle of Samugarh. Jahan's son, Aurangzeb, put Jahan on house arrest. Jahan ruled from 1628 to 1658. He had no state funeral. 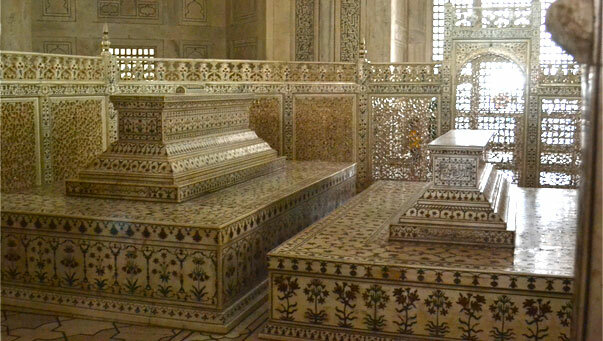 Shah Jahan was laid to rest right next to Mahal in the Taj Mahal. The Mahal was only designed to hold one person. However, instead of building a new tomb for Jahan, his son simply placed him next to Mumtaz Mahal.